Losing a mobile phone is not uncommon and can happen to anyone. However, losing a Smartphone can really be devastating for the user. You not only lose the contacts and media content, your precious data including financial information is at stake. Not to mention the very expensive piece of hardware. There are a few awesome options to track an Android smartphone, but Google recently unveiled a new and easier way to track a misplaced Android device. It makes locating your lost or misplaced Android device as simple as child’s play, literally. In a recent development, Google has made locating an Android device simpler than ever before. You will need to use regular Google search on your computer browser for this. First of all, you will need to ensure you are logged into the same Google account from computer browser that is being used in your Android tablet or phone. It is necessary to have the newest version of Google app loaded on the device. Now, type this phrase-“find my phone” in the search bar of the web browser on the PC. 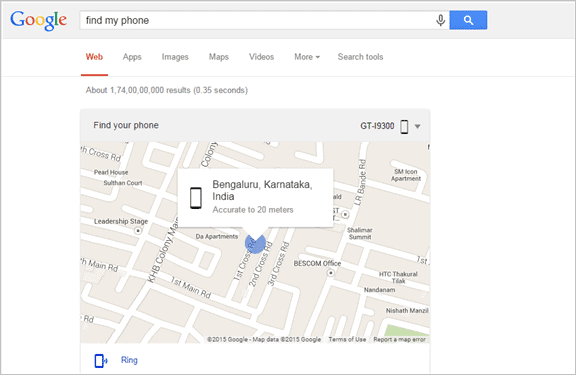 When the aforesaid conditions are met, Google pops up a map on the browser window showing the location of your phone. The location is more or less accurate and the search may take a few seconds. You will find the name of your device displayed with the results as well. Now, you will need to pinpoint the exact location of the device. To do so, click on Ring on the result window. Google will pop up a message saying the phone will ring at peak volume for 5 minutes. To stop the phone ringing, you need to press the power button on the phone. 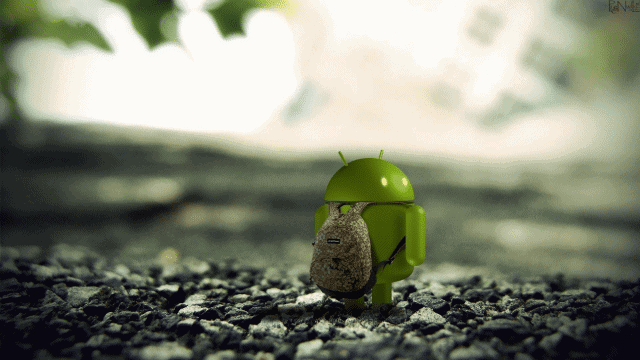 Why Google Your Lost Android Device? Some users may feel why they should use this new feature to locate a misplaced Android device when the same can be achieved by using the Android Device Manager (ADM). The much touted Android Device Manager app lets users track their Android phones and they can also wipe data remotely using this app. Google unveiled this app way back in 2013. You need not use the ADM or any third party utility for this. All you need to do is use the PC’s usual Google search feature using a web browser. The new feature basically uses the ADM functionality in online search. You can actually use any PC with internet connection to track your Android device. You need to be logged in using the same Google account being used by the phone. The feature works in the same way on an Android tablet. In fact, you can track the location of more than one Android device using the new search feature. The devices will be listed separately in the search result and you need to choose which one to ring. Above all, its quick, convenient and absolutely free. As you learn about this new feature to track a misplaced Android device and try it, you may feel quite charged up about this. However, the new feature is not exactly a silver bullet. It does have some limitations and you need to be aware of these too! The feature is of no use when there is no wifi connection or cellular network available. If the phone is switched off or the thief removes the battery, this feature will be ineffective. Both the PC you are using and the device that has been lost, should be logged into the same Google account and they need to be synced. It is an Android exclusive feature. Do not try it on iOS devices with Google app installed. As a matter of fact, iOS users have their own app to locate lost devices which relies on iCloud. There is no denying Google has come up with an impressive and idiot proof feature for users to locate an Android device that is misplaced. It will save you from the hassles of searching the house frantically when the device is buried in a laundry basket or under a heap of pillows! It is meant for locating the device only. So, for erasing data securely and remotely, you will still need to use the ADM app.